"Verde serves communities by building environmental wealth through social enterprise, outreach and advocacy." Verde Landscape is a landscape contracting business (License # 8703) and commercial herbicide operator (License # AG-L1002553CPO) that recruits crew members from Hacienda Community Development Corporation (CDC)'s affordable housing units, the Cully neighborhood, and other low-income communities. Verde Landscape is Verde’s longest-running social enterprise; it commenced operations in 2005 (the year Verde—the nonprofit organization—was established) by providing landscape maintenance services to Hacienda CDC properties. Since that time, it has progressed to offer higher-value, higher-skilled services in and outside the Cully neighborhood, including stormwater management, habitat restoration, sustainable landscape installation and maintenance. Beyond simply serving as a landscape contractor, Verde Landscape seeks to develop a genuine, sincere relationship with our clients through our value-added services that improve the environment while engaging communities in green workforce development. Verde Landscape is made up of a crew that participates in a long-term (four-year) training program, the goal of which is to connect low-income people of color in the Cully neighborhood and other racially diverse and low-income neighborhoods in the Portland area with access to good jobs in the green economy, while also investing in their long-term career development. 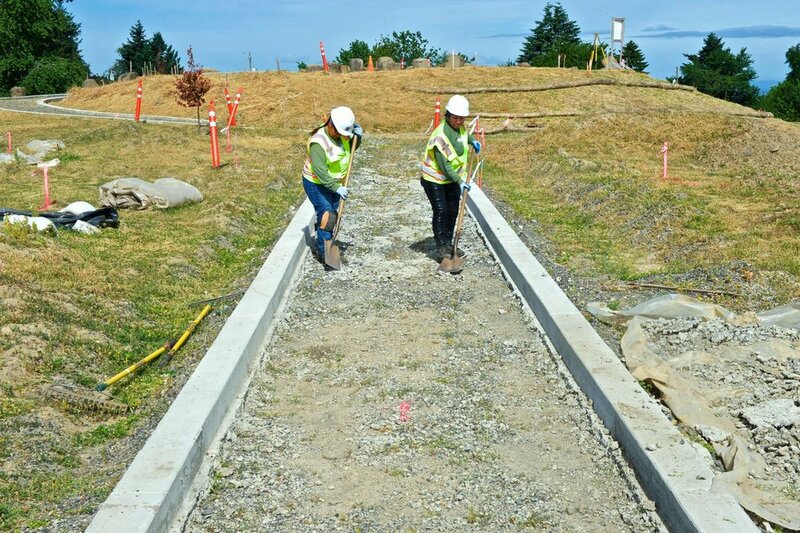 Crew members Rosa and Zoemy prepare a pathway at Cully Park. Crew members pose on the Tilikum Bridge where they provide maintenance for the landscaping features.